It looked as though nothing could stop Andy Murray after he reeled off five straight games to take control of a Wimbledon semifinal that hadn't been going his way. Then chair umpire Jake Garner made an announcement: They were going to stop play to close the roof on Centre Court. Murray pointed skyward, where the late-evening light was still shining brightly enough to play. Players rarely win these sort of arguments and Murray was no exception. But instead of letting it ruin his evening, he came back after a half-hour break and closed the deal against No. 24 Jerzy Janowicz to make the Wimbledon final for the second straight year. Murray is one win from becoming the first British man since 1936 to win the home country tournament. 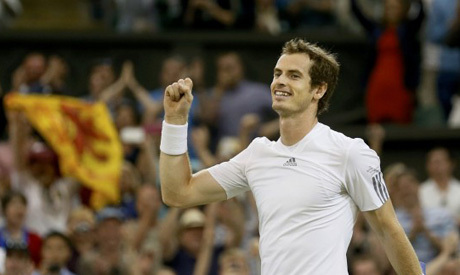 Murray won 6-7 (2), 6-4, 6-4, 6-3 on Friday and figures to be the fresher player when he meets No. 1 Novak Djokovic in the final Sunday - the third time they've met in a Grand Slam final over the past 10 months. They've split the last two, with Murray winning a five-setter at the U.S. Open last year and Djokovic winning in four sets in Australia to open the 2013 major season. The reason for the lateness of Murray's match was the way Djokovic's win over No. 8 Juan Martin del Potro went down. It was a 4 hour, 43 minute affair, a record for a Wimbledon semifinal. It was a back-and-forth, bone-wearying 7-5, 4-6, 7-6 (2), 6-7 (6), 6-3 victory that was supposed to be the undercard on the day's schedule but turned out to be something much better. ''One of the most epic matches I've played in my life,'' Djokovic said. It was filled with huge groundstrokes, long rallies and plenty of touches of good humor from a couple of players who have long had ample respect for each other. Mixing offense with his best-in-the-world counterpunching, Djokovic slid on the dried-out grass behind the baseline, did the splits a few times and repeatedly returned del Potro's serves that reached up to 130 mph. He finished with 80 winners over a match that encompassed 368 points. Djokovic has won 10 of his last 12 five-setters; del Potro lost his fifth consecutive match that's gone the distance. The key moment in the deciding set Friday came down to conditioning. Leading 4-3 and receiving at 15-all, Djokovic hit a drop shot-lob combo to close out a breathtaking 22-shot rally. Del Potro dropped his hands onto his knees and clearly hadn't regained his wind on the next point, when he sliced an easy backhand into the net. Two points later, Djokovic had the break, and the 5-3 lead. He saved a break point in the final game by hitting an off-balance drop shot winner off a del Potro service return that clipped the net cord. Two points after that one, Djokovic had his 53rd career win on grass. ''When you feel good physically, when you know you're fit and you don't feel a huge fatigue, that gives you mental confidence, obviously,'' Djokovic said. Though Murray dropped the first set, then an early break in the third, his match against Janowicz, the first Polish man to make a Grand Slam semifinal, was a bit anticlimactic, both from a quantity and quality standpoint. Not that anybody in Britain cares. Murray carries the hopes of his country with him every time he steps foot on the grass at Wimbledon. He's put a lot behind him since he appeared in last year's final and lost to Roger Federer. He won the Olympic gold medal on Centre Court, then followed that with his U.S. Open victory to end Britain's 76-year drought for a male Grand Slam trophy winner.